You ought to know Mr. Mistoffelees! From Mr. Mistoffelees’ Conjuring Turn. When he was curled up by the fire. While he was asleep in the hall. How accurate are the published figures about swine flu? Once the decision was taken to skip swabs and diagnose on symptoms only, the figures have likely to have become very unreliable. Is anyone objectively studying the percentage of those who have a swine flu diagnosis from the questionnaire only, who actually have evidence of swine flu virus, so we can understand just how accurate, or inaccurate the figures are? Reports such as “100,000 new cases of swine flu last week alone” do indeed generate alarm. What are the real figures? If nobody is interested to discover the real figures then maybe at least the reporting should be changed to “100,000 new cases of flu-like illnesses last week”, or something similar. Why are so many patients being prescribed Tamiflu? What we know about Tamiflu is that it may be able to delay the spread of the virus for a short period of time (but not prevent it’s spread ultimately); that it can shorten the duration of the illness by about a day [Treanor JJ, Hayden FG, Vrooman PS, et al. Efficacy and safety of the oral neuraminidase inhibitor oseltamivir in treating acute influenza: a randomized controlled trial. JAMA. 2000;283:1016-1024] (but not that it can save lives or even prevent serious complications of the flu); that it is “an unpleasant experience” to take with side effects ranging from nausea, vomiting, and hallucinations to serious, rare effects like Stevens-Johnson Syndrome and toxic epidermal necrolysis . As we have no evidence that it is safe to take in pregnancy, and best practice would therefore suggest that it should only be prescribed when there is significant threat to the foetus, but that’s not the standard being used. An interview with a pregnant woman on BBC news last week showed her picking up her Tamiflu even though she personally thought she only had a cold, because she’d been advised to take the medication on the basis of “better safe than sorry”. Finally, if seasonal flu kills 8,000 to 9,000 people every year in England, (and up to 19,000 in 2002), is the management of swine flu leading to a different way of dealing with seasonal flu in the future? Will we now see seasonal flu diagnosable online and by telephone by non-medical staff and the mass prescribing of Tamiflu every winter? Mihaly Csikszentmihalyi’s answer to Edge’s 2009 question is the view that it’s time now to start to focus on how branches of knowledge connect to, and influence each other, and to develop a new science which goes beyond the current complexity science by emphasising the relationships between phenomena rather than the phenomena themselves as discreet entities. The idea that will change the game of knowledge is the realization that it is more important to understand events, objects, and processes in their relationship with each other than in their singular structure. Western science has achieved wonders with its analytic focus, but it is now time to take synthesis seriously. We shall realize that science cannot be value-free after all. The Doomsday clock ticking on the cover of the Bulletin of Atomic Scientists ever closer to midnight is just one reminder that knowledge ignorant of consequences is foolishness. Chemistry that shrugs at pollution is foolishness, Economics that discounts politics and sociology is just as ignorant as are politics and sociology that discount economics. Unfortunately, it does not seem to be enough to protect the neutral objectivity of each separate science, in the hope that the knowledge generated by each will be integrated later at some higher level and used wisely. The synthetic principle will have to become a part of the fundamental axioms of each science. How shall this breakthrough occur? Current systems theories are necessary but not sufficient, as they tend not to take values into account. Perhaps after this realization sets in, we shall have to re-write science from the ground up. Note, that he not only emphasises connections and synthetic thinking, but twice in his short answer he mentions the importance of values. That’s because it’s actually not possible to fully comprehend natural phenomena without considering values. This answer reminds me not only of one of the best books I’ve read in recent years – Linked, but also Prince Charles’ recent Dimbleby Lecture where he argues a similar case. Do you ever think why am I only person to see something rationally and reasonably, and everyone else seems biased? Well, that’s a common experience. It’s also common to wonder why nobody really understands you, and to always fail to completely understand another person. The practice of medicine is based on understanding……trying to understand what another person is experiencing in order to try and identify whether or not they are ill, and what kind of help they might need. Sounds simple, but it’s far from it. I recently read two related articles which explain these difficulties very clearly. As with most insights, what they have to say seems clear and obvious once you read it. Both articles deal with the differences between self-knowledge and the knowledge of others. In essence they show that for self-knowledge we have continuous access to our inner subjective experience of reality, including the full range of sensory inputs, our emotions, and our thought processes. However, when we try to have knowledge of another person we have no direct access at all to any of these phenomena. How exactly does another person perceive and experience a particular colour, or sound, or smell? What emotional experience are they having? And what are they actually thinking? We don’t know. We can’t know. We have to listen to what they have to say and watch how they behave then make our assumptions. Our assumptions, of course, are based on our perspective, not on theirs. So it isn’t possible to know another person the way can know ourselves. On top of that, our subjective experience conveys a degree of authenticity to our sense of self, which can never be matched when interpreting the language or behaviour of another. It’s just how things are. We function in a way which gives great weight to our subjective experience…..even our opinions and assumptions about others gain, for us, this high degree of authenticity. We have a tendency to think we can understand another person better than they can understand themselves. The reality, however, is just the reverse, and we should always doubt our understanding and judgement of others more than we do. That’s why true empathy requires a high level of humility. Isn’t this a lovely effect? 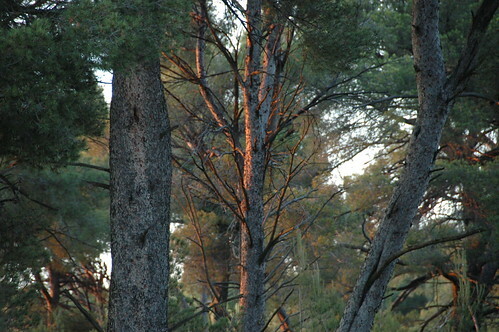 The colour of the light of the setting sun on the trees in the forest…..
What he’s highlighting is the tendency for some science advocates to suggest that science is not just the only way to know the truth, but to assume that the scientific approach is in all circumstances the one likely to produce the most positive outcome. This relates to his other work where he highlights “illusions of control” – this insight has been dramatically shown to be correct in the global collapse of the financial and banking system. I always find it disturbing when an “expert” claims absolute certainty about something….yes, pretty much always! The humility which comes with awareness of our limits of our knowledge or skill is a great quality in my opinion. Let’s consider Medicine –which only started saving lives less than a century ago (I am generous), and to a lesser extent than initially advertised in the popular literature, as the drops in mortality seem to arise much more from awareness of sanitation and the (random) discovery of antibiotics rather than therapeutic contributions. Doctors, driven by the beastly illusion of control, spent a long time killing patients, not considering that “doing nothing” could be a valid option –and research compiled by my colleague Spyros Makridakis shows that they still do to some extent. Indeed practitioners who were conservative and considered the possibility of letting nature do its job, or stated the limit of our medical understanding were until the 1960s accused of “therapeutic nihilism”. It was deemed so “unscientific” to decide on a course of action based on an incomplete understanding to the human body –to say this is the limit of where my body of knowledge stops. The very term iatrogenic, i.e., harm caused by the healer, is not well spread — I have never seen it used outside medicine. In spite of my lifelong obsession with what is called “type 2 error”, or false positive, I was only introduced to the concept very recently thanks to a conversation with the essayist Bryan Appleyard. How can such a major idea remained hidden from our consciousness? Even in medicine, that is, modern medicine, the ancient concept “do no harm” sneaked-in very late. The philosopher of Science Georges Canguilhem wondered why it was not until the 1950s that the idea came to us. This, to me, is a mystery: how professionals can cause harm for such a long time in the name of knowledge and get away with it. Ouch! That’s a pretty negative view of doctoring! It’s not often that you hear people say so clearly that the main improvements in health come from social, economic and political change rather from “therapies”, but it’s true, and it’s not only what I was taught at university, but it’s still a clear message conveyed by people like Prof Richard Wilkinson. It’s certainly worth re-iterating when we’re in the middle of a medical culture which assumes so often that the best thing to do is prescribe a drug or operate on a patient. It’s good to hear a challenge to that mind-set and for the question of “watchful waiting”, or certainly of caring but not intervening with a potentially harmful procedure or drug, to be raised for discussion. I’m a bit amazed that Nassim Nicholas Taleb had never come across the concept of “iatrogenesis” before. It’s a well known phenomenon in the medical world. Would it be a useful concept in other sciences? I expect it would. Again, too often, there is far greater emphasis given to the potential benefit of a technology, than the potential harm. Yet to make informed choices, we need to know both these aspects well. If these points made by Taleb aren’t thought provoking or controversial enough for you, I’ll leave you with this one…..